Home > CVS > New $3 Off Gain & Tide Coupon! New $3 Off Gain & Tide Coupon! Running low on laundry detergent? 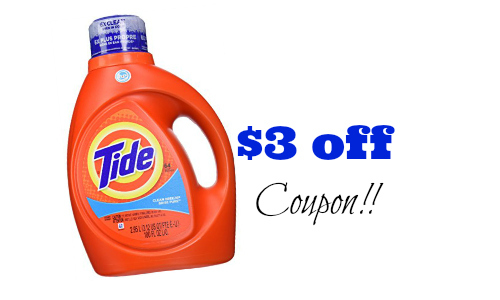 Now is the time to grab Tide laundry detergent thanks to a new $3 off Tide coupon! This coupon if for the large 92-100 oz bottles, and it is a store coupon that can only be used at CVS, but you can also pair in a manufacturer coupon to save even more. This coupon probably won’t last long, so make sure to print it soon! You’ll have up to 30 days to use it once it’s printed.